Fulham caretaker manager Kit Symons would like to be considered for the job on a full-time basis. The 43-year-old, who has been in charge of the club's under-21s, was appointed after the sacking of Felix Magath. "I've done many different jobs within this club and other clubs, so it's certainly something I feel I'm ready to do now," said Symons. "I'm not wishing to big myself up too much, but no-one understands the fabric of this club better than me." Symons took on the role of caretaker manager - a post he has previously filled at Crystal Palace in 2003 and Colchester United in 2008 - on Thursday after Magath was dismissed by the club's owner Shahid Khan. Former Bayern Munich and Wolfsburg boss Magath was appointed Fulham boss in February but failed to save the west London club from Premier League relegation last season. Following a large turnover of players in the summer, Fulham have claimed only one point from their opening seven league games this season and are bottom of the Championship table. Former Wales defender Symons spent three years at Craven Cottage during his playing career, scoring 14 goals in 129 appearances between 1998 and 2001. "I'm really excited about it and it's a great opportunity for me at a club I know well," he said. "I played here and had two promotions. We had some fantastic times on the football pitch and some great memories. I've done the scouting, worked with the under-18s and the under-21s more recently. "I understand what the fans want, what the people working within the club need, and what these players need now. "It's a big job, without a doubt, but I'm really, really excited and very confident that we can start moving up the table very, very soon." "When I heard the news about Felix Magath's sacking it was a feeling of relief that it was over. "The Championship is a tough league and for them to be aiming to get back in the play-offs is going to be very difficult and maybe not realistic. What can be retrieved is the pride which has been lost. Fulham supporters feel embarrassed about what has gone on there. "What I want to see is the right person in charge who has got the club at heart, knows what the supporters are like and who can get the best out of the players. He needs to be given two or three years to build something which has been knocked down in a matter of months." Magath won only four of 20 games in charge of the west London club, and that was enough for Fulham's fans to call for his sacking. "It has been a difficult time for the club - there's no getting away from that," Symons said. "Everybody craves stability now and I aim to give that. "The overwhelming feeling I get is of genuine support from everyone. It's a huge boost for anyone going into a new job if you've got people behind you. "I think the Fulham fans know I'm 100% committed to the club, and that's what they want to see." 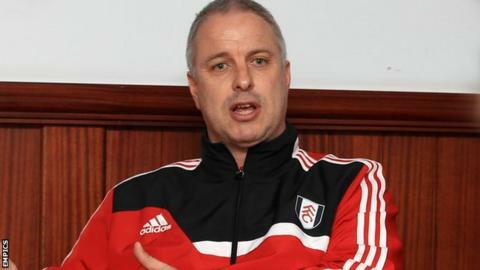 Symons is currently part of the backroom staff with the Wales national team, working under former Fulham boss Chris Coleman, and he is keen to continue in that role should he be appointed manager at Fulham. "It is something I did mention to Alistair Mackintosh [Fulham chief executive] and that is something that would have to be addressed as and, hopefully, when I get offered a job on a permanent basis," he said. "I love the Welsh job and it is fantastic. That would have to be a discussion with Alistair, the chairman, Chris and Jonathan Ford from the Welsh FA as well. "It is a long way off at the moment and I need to get my head down and start winning games for Fulham."